Paris and New York. As two of the world's cultural epicenters—and, among a certain set, the cultural epicenters—the cities are constantly being compared in terms of everything from fashion and food to art and attitude. Those differences have been the inspiration behind so many books, movies, TV shows and plays, they've become clichéd. And yet "Paris/New York," a two-minute spot for Open Skies (a British Airways subsidiary that flies exclusively between Paris and New York), manages to be completely mesmerizing by drawing a series of visual comparisons between the two. 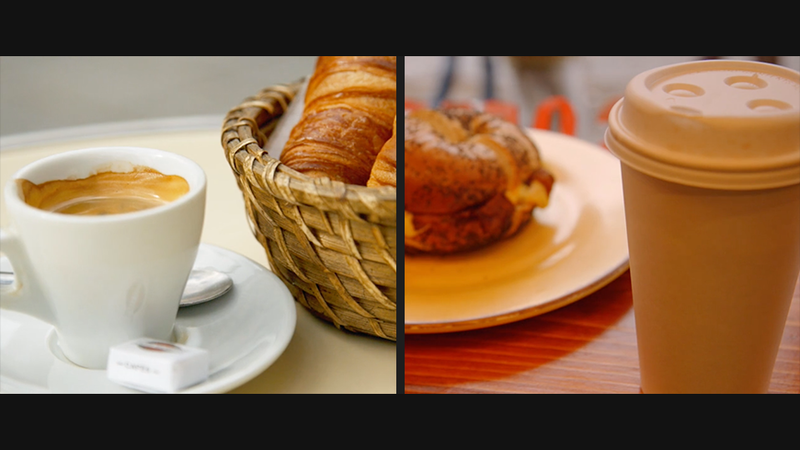 To create the ad, Paris-based filmmaker Franck Matellini shot time-lapse video of dozens of quotidian scenes in New York and Paris, then connected similar shots on a split screen. We see a bridge on the Seine matched to a bridge on the Hudson; the bustle surrounding the Arc de Triomphe next to the Washington Square Arch; the Métro running parallel to the subway. The video progresses from sunrise to sunset, ending with a final sunrise over the wing of an Open Skies plane. Some of the pairings are a bit stereotypical (the Eiffel Tower next to the Statue of Liberty; a plate of escargots alongside a pepperoni pizza), but other seemingly mundane shots (Vélib' vs. Citibike; a man selling crêpes on the sidewalk paired with a street meat vendor; graffiti on the sides of two buildings) provide delightful little snippets of everyday life. And, of course, there are the requisite gorgeous wide shots of skylines and riverfronts that could make any New Yorker want to hop a plane to Paris, and vice versa.